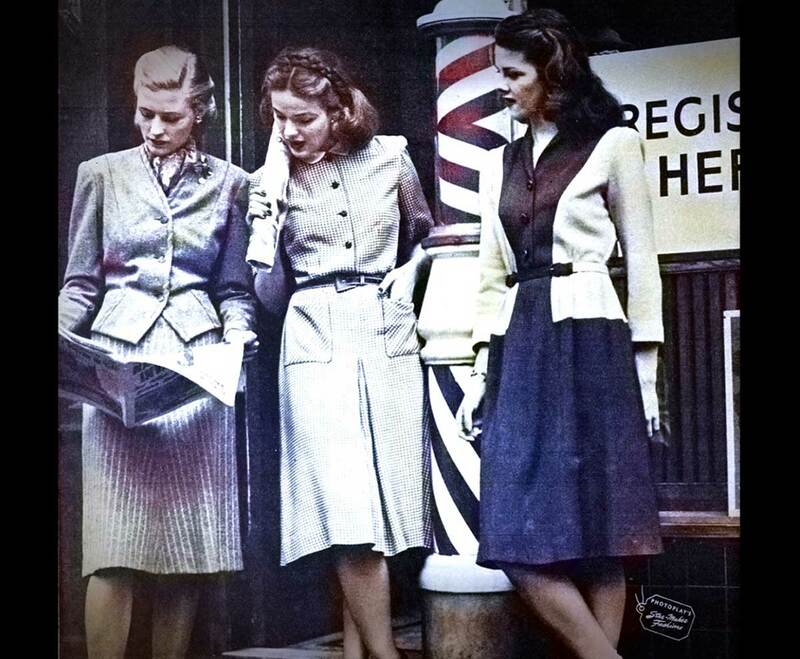 The war does not dampen these Fall dresses in 1944. Young American women prepare for the chilly days ahead. Glamour Daze casts an Autumnal eye on the new Fall fashions and picks a ballot of Fall dresses, Fall suits and Fall coats to win your favour. These three young women stopped the traffic in these smart outfits. Left: A Personality Twosome in plain and pencil-stripe grey wool and rayon flannel. Center: The Lynbrook classic gives you checks to balance your wardrobe. Printed on spun blue rayon which looks and feels like flannel. Right: Double your loveliness in this navy rayon gabardine with natural cashmere jersey. It’s Autumn – time for October’s bright golden colors. Pegasus, the flying horse of the heavens is directly overhead in the night sky. In fashion time, you’re thinking of new fall dresses, new twinkling touches to make old dresses as new. Left: Joyce Reynolds in a Hi Dee Junior dress for sunup to sundown. New high-rising skirt of deep violet cotton velveteen; tuck-in wool jersey blouse in light lilac. Right: Tamara Toumanova wearing a Vera Maxwell fencing suit in dashing gold touched with black braid. Matching topper coat with black Persian collar. Left: Bewitching Betty Barnes blouse with a stand up ruffle lovely as a necklace. Demure as downcast eyes. Gentle as a whisper. Made of fine rayon crepe by Colonial Mills with the fine tailoring touches that mark all Barnes creations. Right: Dazzling as the milky way. This telescope-trim black dress with detachable Peplum. It is banded with light catching braid. A Sheila Lynn creation of rayon crepe. 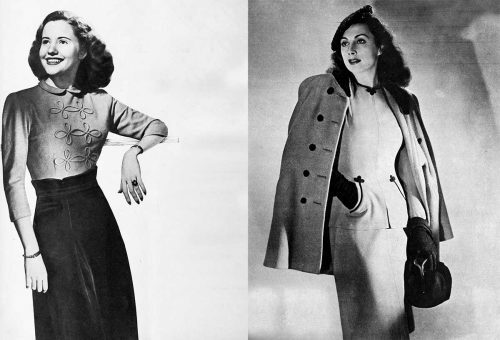 Left: Joyce Reynolds poses in a young sophisticated Margot jacket dress of black Enka rayon faille, sparkling with sequins. Right: A smart one piece L’Aiglon shirtwaist dress of rayon crepe and to her right a rich twill velveteen in prism colors for junior figures.